William Harvey was the first person to correctly describe blood’s circulation in the body. He showed that arteries and veins form a complete circuit. The circuit starts at the heart and leads back to the heart. The heart’s regular contractions drive the flow of blood around the whole body. William Harvey was born on April 1, 1578 in Folkstone, England. He was born into a relatively wealthy family: his father, Thomas Harvey, was a successful businessman who became Mayor of Folkstone; his mother, Joane Hawke, gave birth to nine children, of whom William was the eldest. William Harvey started his education at a small elementary school in Folkstone, moving on at the age of 10 to the elite King’s Grammar School in Canterbury. While attending King’s Grammar School he lived in his uncle’s home and spent most of his school time learning the classics – Latin was essential throughout Europe for academic and legal work. In 1593, aged 15, the young Harvey enrolled as a medical student at the University of Cambridge; he had won a scholarship to pay his living costs and tuition fees for six years. In the final two years of the scholarship, he spent some time at universities in France, Germany and Italy, learning more about science and medicine. The greatest influence on Harvey at Padua University was his teacher, Hieronymus Fabricius, who was a skilled anatomist and surgeon. The two became friends and Harvey learned from Fabricius that dissection offered a route to better understanding of the human body. Fabricius had discovered valves in human veins in 1574, although he did not publish his discovery until 1603. In terms of historical context, while Harvey was studying in Padua, William Shakespeare was completing Hamlet, which most critics regard as his greatest work. Harvey returned to England in 1602. On his return, the University of Cambridge awarded him a Doctor of Medicine degree, adding to the one he already had from Padua. He then moved to London to work as a physician. He joined the College of Physicians in 1604, becoming a Fellow of the College in 1607 and Head Physician at St Bartholomew’s Hospital. In 1615, aged 37, Harvey became the College of Physicians’ Lumleian Lecturer, specializing in teaching surgery. In this role, he gave an annual series of lectures, while continuing his work at St Bartholomew’s Hospital. By the time he was 40, Harvey had won recognition as the best physician in London and was appointed as physician to the king – King James – in 1618. In 1632, aged 54, he became physician to King Charles. Harvey made his discoveries because he ignored the conventional wisdom of medical text books, preferring to make his own observations and form his own conclusions when he dissected animals. Remarkably, western medical beliefs and theories about blood and circulation had advanced little since Galen wrote his medical textbooks in Rome 1400 years earlier. In 1628, aged 50, Harvey published his masterpiece – usually referred to as De Moto Cordis – the Motion of the Heart. Its full title in English is: Anatomical Studies on the Motion of the Heart and Blood in Animals. In De Moto Cordis Harvey became the first person to accurately describe the function of the heart and the circulation of blood around the body. 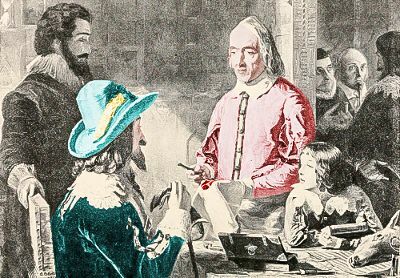 William Harvey discusses his theory of blood circulation with King Charles the First. Harvey’s knowledge came from observations he made of blood flowing through the veins and arteries of living animals that he cut open. Through modern eyes, his living dissections look cruel, and there were no anesthetics in Harvey’s time. Nevertheless, it is how we arrived at an understanding of blood and its circulation in the body. Harvey finally put to rest some of the errors Galen had made so many years earlier. Yet Galen did not get everything wrong. Some of his teachings were useful. At one point Galen had to flee from Rome because his methods threatened the careers of Rome’s quack physicians. Ironically, in correcting Galen’s mistakes about blood and circulation, Harvey himself ran into trouble with Europe’s latest crop of quack physicians, who were making great use of Galen’s worthless bloodletting methods. While not forced to flee for his life, Harvey’s own medical practice declined because of the barrage of criticism he took from physicians. In fact, even 200 years after Harvey’s death, Galen’s bloodletting was still being used, probably shortening the life of Ada Lovelace. Despite the storms he had caused, the majority of respectable anatomists saw the truth of Harvey’s work within his lifetime. In 1651, aged 73, Harvey donated money anonymously to allow the College of Physicians to build a new library. The identity of the donor became known and the College built a statue in Harvey’s honor. there is no to-and-fro movement of blood in the veins, but a constant flow of blood to the heart. William Harvey died, aged 79, in London on June 3, 1657 at the home of one of his brothers. The cause of death was most probably a cerebral hemorrhage. He had no children, and his wife, Elizabeth Browne, died before he did. William Harvey’s grave can be found in the village of Hempstead, in the English county of Essex. Images of Harvey and others digitally enhanced and colorized by this website. Image of circulatory system courtesy of Cancer Research UK, modified by this website. "William Harvey." Famous Scientists. famousscientists.org. 8 Mar. 2015. Web.